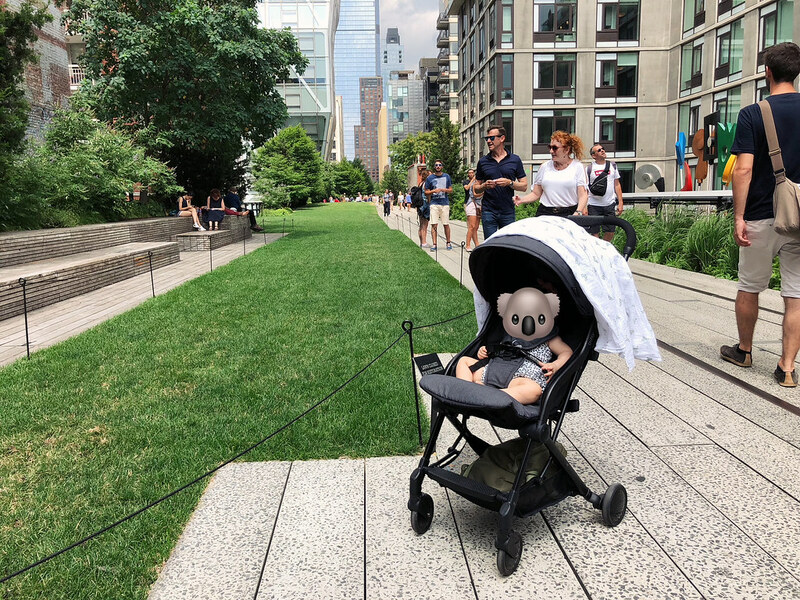 In July, I took my 8-month-old baby (hereby named “Koala”) on an adventure-filled NYC girls trip. What fun, what exhaustion, what jetlag! It was the two of us for two weeks, staying with amazing friends who didn’t bat an eye when I asked if we could crash. Are you thinking about a big international trip with your baby? Why the hell not, right? Here are my tips for planning, packing and getting your butts over there. First things first. Getting to NYC! I booked us on direct flights with EVA Air out of Taoyuan Airport. Stopovers with a baby are for souls more courageous than mine. At 8 months, Koala was a “lap child” so she didn’t need her own seat, but her ticket cost 10% of my fare. (Kids under two don’t fly free with EVA.) To be sure she had the bassinet, I looked up the seating plan for our flights on Seatguru then called EVA customer service to request both the bassinet and the specific window seat I wanted. They’ll ask for the baby’s height and weight measurements, so make sure you have that info in case your baby is too tall to fit. Both 14+ hour flights there and back were pretty uneventful. Koala was in a great mood, completely spellbound by the fact there were 40 or so strangers sitting in our section of the plane. Whenever I needed to go to the bathroom, I pressed the service button and a friendly EVA flight attendant came over to hold her while I snuck away. When Koala needed to go to the bathroom, she pooped or peed at her leisure then I shuffled us to the bathroom to use the changing table. I packed a few compact toys that I revealed to her gradually, like a magician, and she ate fruit purees by sucking out of the pouch directly, something she had never done before but picked up quickly. I prepaid for WiFi access on the flight (it costs US$20.85 for 24 hours) but it was miserably, agonizingly slow. Leaving the airport. Setting up internet data. For me, getting out of the airport was the most stressful part of the trip. It’s a pure circus trying to find your Lyft/Uber driver at the pick-up area at JFK, not to mention I had a big suitcase, a little suitcase and Koala strapped to me in a carrier. Once we landed I turned my phone on to activate the international data roaming through FarEasTone. It’s 299NT per day, which is not cheap at all, but I knew I would need to book a Lyft and I wanted to be able to text my friends in case anything came up. FYI, I’m one of those people who makes a pretend “I’m on the way, be there in an hour!” call so the driver knows people are expecting me. The next day we ventured out in the early morning to find a T-Mobile store. T-Mobile sells a US$30 prepaid International Tourist SIM card that lasts 21 days and has 2GB of data, which is more than enough for texting, Google Maps and calls while you’re out and about. It’s perfect for tourists in the city. Sprint doesn’t do anything similar and I don’t think I’ve found anything else that’s as easy to set up. My stroller. My precious, precious stroller. 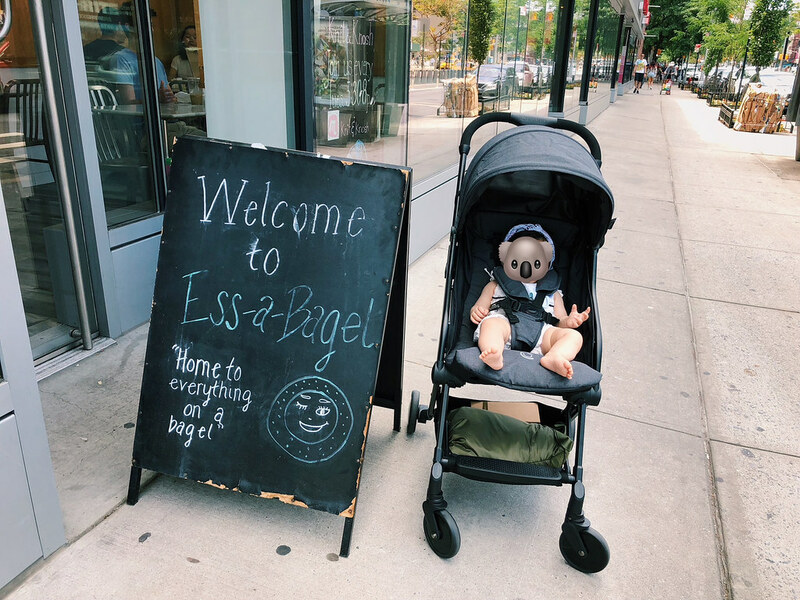 Since I have an unhealthy obsession with strollers, the next important thing I did was visit BuyBuyBaby on 7th Ave to shop for a travel stroller. 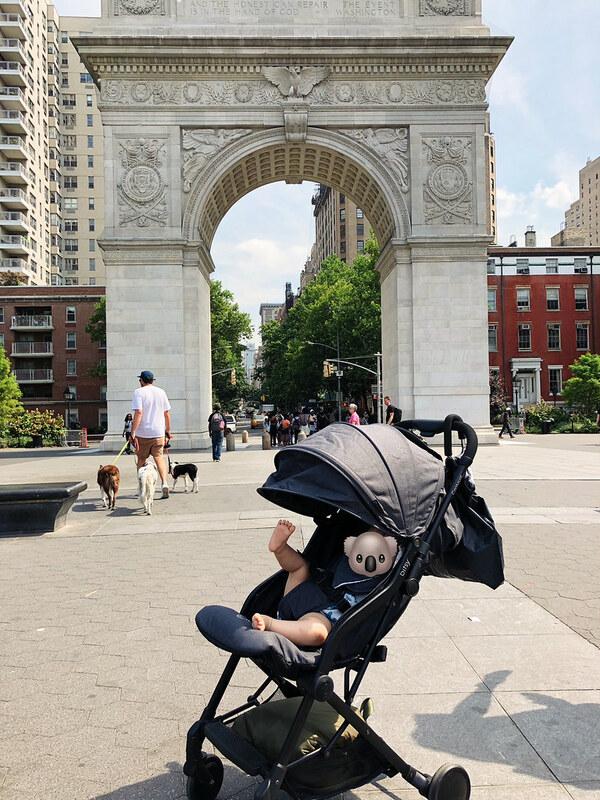 I didn’t take mine to NYC because my everyday stroller in Taipei is a beast. Also, the smart shopper in me knows that stroller prices in Taipei can be 40% higher than overseas and a lot of brands aren’t available. 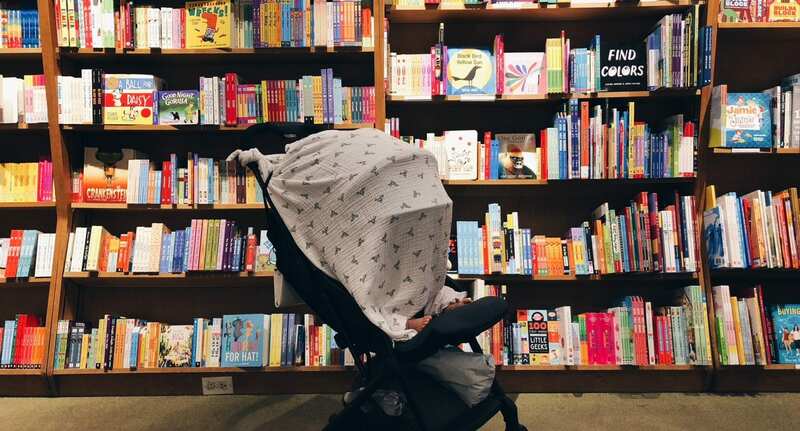 These are two excellent, excellent reasons to share with anyone who questions the need to spend hours (upon hours) doing online research and watching YouTube reviews of stroller models. Drumroll…I ended up purchasing the Contours Bitsy. I really like it, as you can probably tell from the photos in this post. Contours is not a well-known brand at all, so if you’re into strollers you’re probably looking very confused right now. But I compared the Contours Bitsy with more expensive travel-friendly strollers (Maclarens, Mountain Buggy, Pockit) and decided it was most suitable for our travel needs and life in Taipei. 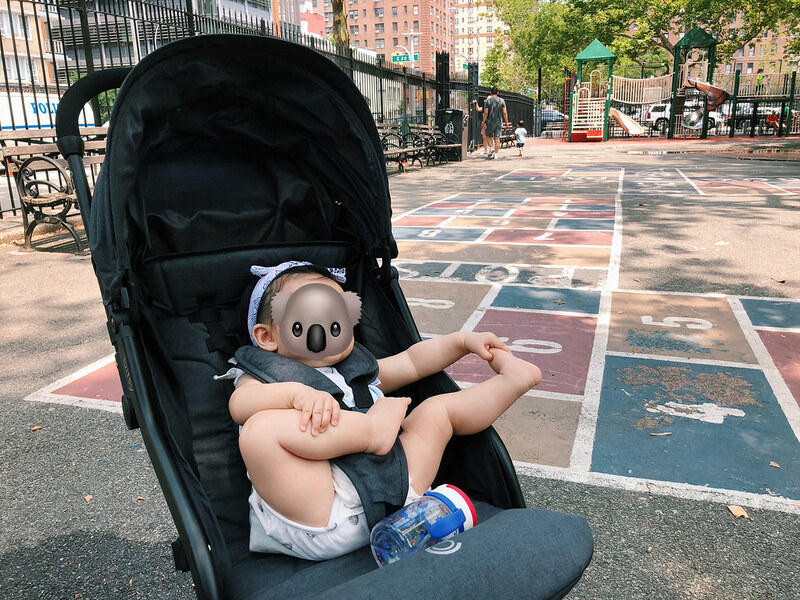 It’s really compact, it can be folded and released with one hand (while I’m holding baby with the other arm) and it has a very generous sun shade. The only downside is it’s too big for the overhead compartment on the plane, but that’s a small issue when you consider it’s so reasonably priced at US$180. Smart shopper tip: if you go to BuyBuyBaby, sign up for their mailing list and you’ll get a 20% off coupon for their website or in-store, which is basically like making money, not spending it. So while the Bitsy is available on Amazon, if you buy from BuyBuyBaby you’ll pay $144 instead of $180 retail price. Hello, you just made $36. Wait, I almost forgot to mention if you have a stroller hook or carabiner, take it with you so you can hang stuff like the pineapple cakes you plan to give your cousin Sherry (see above). OK, now I’m really done. What to pack, and what to buy. 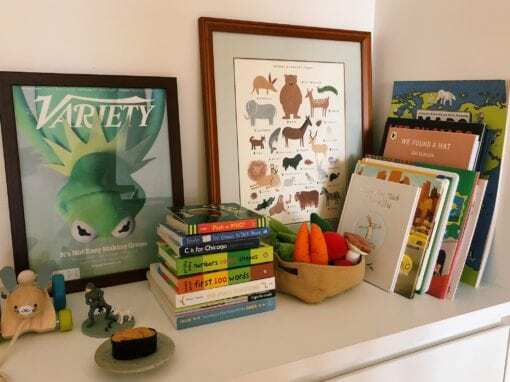 My priority for the trip was to minimize Koala’s stuff at my friends’ apartment while making sure she felt comfortable in the new environment. This meant packing a couple of bulkier items, including our Stokke baby set so she had a dedicated place to sit and eat her meals. 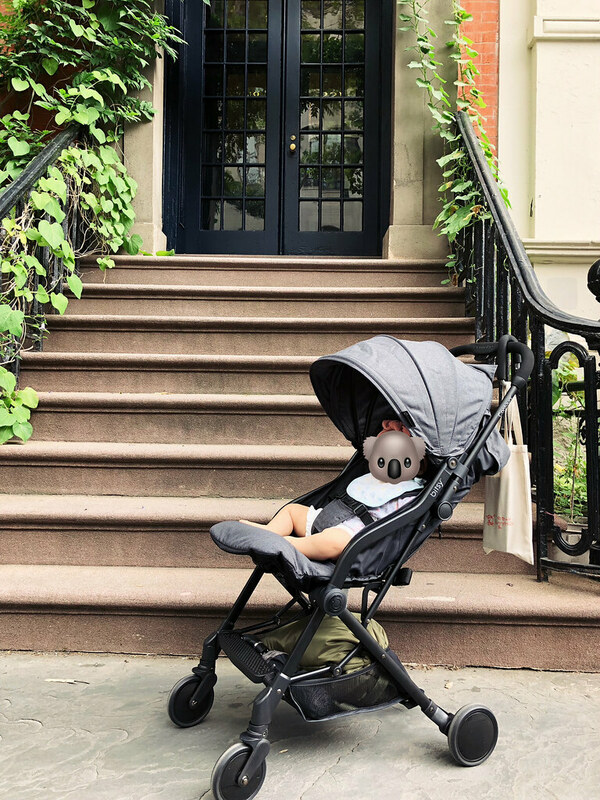 (My friends have an existing Stokke high chair for their now 7-year-old son.) I also packed her ventilated mesh sleeping mat because this baby can sweat like crazy. She slept on a queen-sized bed with me. Also on the packing list were her soft toys (the IKEA vegetable set is always a winner, as is the Baby Einstein Musical Toy), her quick-drying bath towel (I use a classic white one from Taiwan brand, les enphants. It’s not available online, only in-store. ), and her little blanket and pillow in case she was like, “where the hell is my little blanket and pillow!” Other things I packed for her: a couple of swaddles to act as blankets or play surfaces, toiletries like nail clippers and nose sucker, a couple of teethers and her meal set (bowl, food-catching bib, water bottle and spoon). No bottles or formula necessary since I’m still breastfeeding. My biggest worry was where to wash her, so I bit the bullet and bought this well-reviewed $13 inflatable bathtub on Amazon, and packed the compact manual pump we already had at home. Other stuff in the same Amazon order: Bambo Nature eco-friendly diapers (not sold in Taiwan so I wanted to try them), baby wipes, foaming hand soap (which I also used as dish soap for her meal stuff), baby sunscreen, and 2-in-1 baby wash/shampoo. Just everyday necessities that I didn’t want to have to worry about buying once we got there. I also ordered some baby girl headbands from Etsy. Ones from this store are so cheap and cute compared to the imported ones I’ve seen in Taipei. At BuyBuyBaby and Whole Foods, I couldn’t resist getting her US-made organic food pouches with flavor combinations we don’t typically see in Taiwan, like avocado, kale, beets and zucchini. My favorite packaging was the Happy Baby Clearly Crafted line, which is about $2 per pouch. Another tip for fellow smart shoppers: you’ll save money if you can avoid CVS and Duane Reade, the big chain drugstores. Their prices can be a lot higher than BuyBuyBaby and Bed Bath & Beyond on 6th Ave.
Where to go! What to do! This trip was very different from previous trips I’d taken to NYC pre-baby, but it was still busy and invigorating. Surprisingly, I ended the trip feeling like the city is so baby-friendly, in some ways even more than Taipei. People held doors open for us, they made way on the sidewalks so we could pass by, and most important of all, cars stopped. Like actually stopped. A stark contrast to Taipei where cars and scooters turn into the street when pedestrians have the green light to cross. It makes me explode. Most of the days we were flexible and just went with the flow depending how jetlagged we were. Sometimes we had the best time simply wandering around and seeing where the day took us. Though to be honest, we mostly stuck to the Union Square and Flatiron area since that was where we were staying. A couple of highlights: The High Line on the west side is especially great for strollers and people-watching. Make sure to check their website to see which entrances have elevator access. We also loved the children’s book section of the Union Square Barnes & Noble, and the boutique shop Books of Wonder on 18th Street. 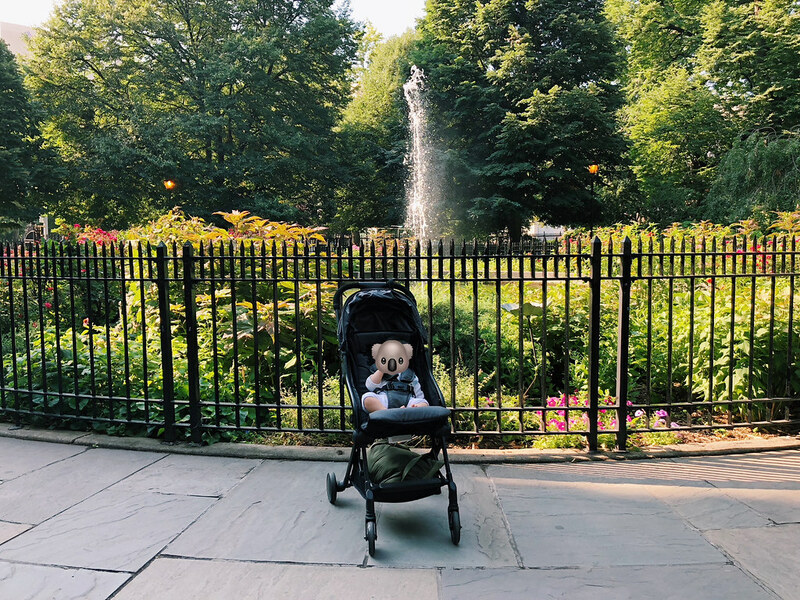 Anytime we stopped by a park, we’d turn in to soak up the green-ness, watch squirrels and kids and dogs, and maybe take a nap (Koala, not me). There were plenty of things happening in Madison Square Park, Washington Square Park and Union Square Park too. Just so much to see, hear and experience! And way less stressful than navigating museums with the crowds. 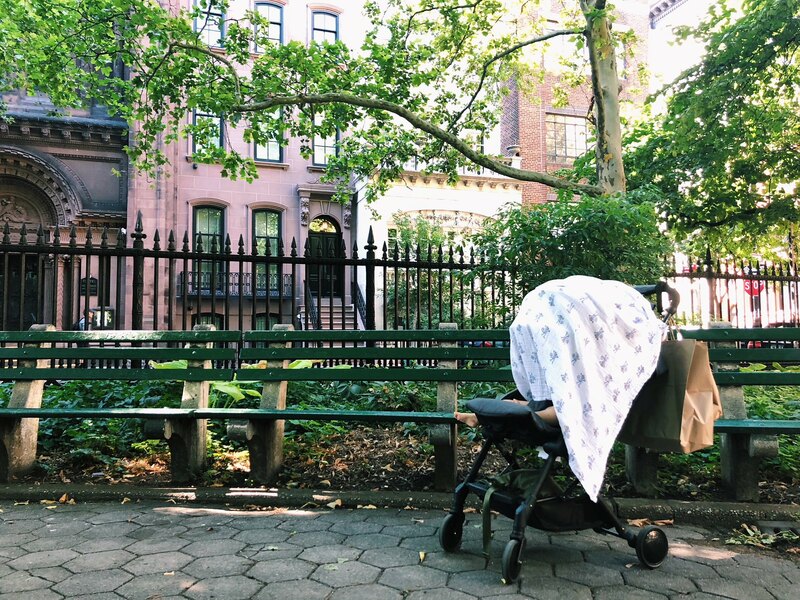 I planned two baby dates with friends who live in NYC — venturing to Midtown East and Brooklyn for those — and we even took a baby music class with my friend and her baby who go every week. Koala loved it. I’d absolutely recommend doing the same if you have time. It’s a great chance to mix with local New York babies and do something not so touristy. Search for “new york baby music class” for a bunch of options. You can do the same for baby gym or baby yoga etc. Dining out was a bit trickier, but we managed to find kid-friendly restaurants on Google Maps by seeing if places offered high chairs. I’d also suggest checking for wheelchair access in case there are lots of steps. In all honesty, though, the food took a back seat since I cared more about catching up with friends, and less than usual about where we ate. (Don’t worry, I still ate pizza and gelato at every opportunity.) Having said that, there’s absolutely no shame in grabbing food to go and sitting on a park bench when the New York weather is glorious and you’re eating a poppy seed bagel that’s going to make an absolute mess. Before we left Taipei, we made a visit to our pediatric clinic for a general check-up. I also requested a pack of liquid baby meds in case Koala caught a bug on the trip. The doctor sent us off with the meds and a wave goodbye for Koala. I’ll never take Taiwan’s national healthcare for granted! 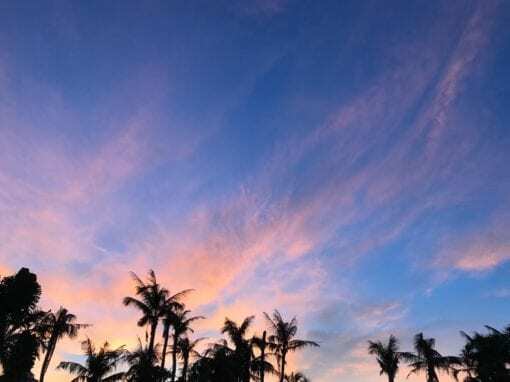 We’ve done a handful of trips across the Pacific with our kids, at varying ages. Some went surprisingly well, while others were disastrous. Cheaped out once with a late-night stopover in the Philippines and will never do that again. Once around the same age as Koala, Lavender cried for 2 hours straight on a flight. 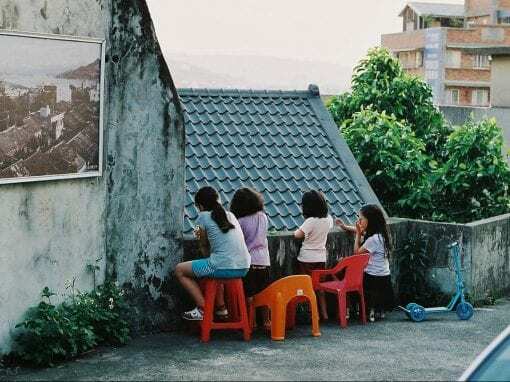 The toughest for us though was probably 1-2, when they can’t sit still, but aren’t old enough to read or color or do anything really for more than 30 seconds.